The rest of my New York trip was a bit of a whirlwind. 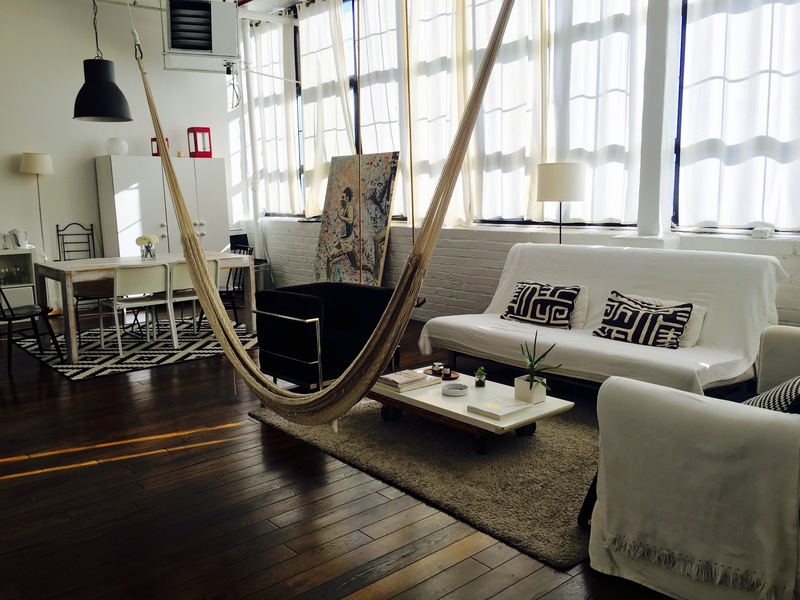 I stayed in an amazing AirBnb in Brooklyn, a building ( The Mckibbin lofts) where they had gorgeous loft apartments. My host was lovely and so were the other guests, including a songwriter, who regularly writes for artists in Nashville! I did 8 classes (in 5 days) while in New York and loved them all, just the fact that I was in NY and taking their classes like a local was really cool. One of my other favourites was Mile High Run Club – they have a super sleek studio which is very inviting and friendly. The workout studio is very modern with around 30 treadmills in 3 rows, with cool lighting and brilliant music. When I visited, and took the dash 45 class, we started on the treadmills and did around 30 minutes interval training – hills, speed work and endurance. We then went on to the floors and used kettle bells for around 10 minutes before we finished on some ab work. I burnt around 400 calories and loved it! Body by Simone is a very dance based class, and I think I just about kept up! We started with a sort of routine which was really energetic, and then went on to use bands to tone our glutes, more dancing and also weights for our arms. If you love something a bit energetic and less like a normal gym class then definitely try it out. I love how in New York it’s so easy to get around, most of the time I took the subway, which is way less complicated than you think its going to be. And thank god for google maps….it saved me more times than I can remember trying to find a different studio. And the fun thing about trying all these classes out too is that it was a great way to see different parts of the city, I stumbled on so many different places I’d never seen before while making my way to various classes. Next up was Circuit of Change, a class which I’d heard a lot about. The class was packed (which is always a great sign) but on their busier classes be prepared for a little squish in their waiting area. And I’ll be honest – the class was completely different to what I thought it was going to be like, I’d just done a spinning class and was expecting a yoga / pilates / mediation class, but before I knew it I was punching, jumping and rocking and rolling my way around my mat! I really liked it though and can see why it’s so in demand. I also tried out a Flywheel (spinning) class at their West 17th Street studio, which was great for a cardio workout and had a nice studio. Aerial Yoga at Anya was also fun and a good workout – our teacher Micheal was really funny, and made the class really good, for both beginners and people who were obviously pros (you could tell by how comfortable they were hanging upside down!). Read about the other classes I took while in New York – Chaise Fitness, Soul Cycle and the Fhitting Room. I go back to New York for a couple of days at the end of my journey so I’m hoping to make it on to the classes I didn’t have a chance to get to like CityRow and S10 class. Are there any other NY classes you think I should try out?